Happy Friday everyone! How was your turkey day? Ours was filled with good food, good people and good memories. Just the way I like it. I hope you’re not out battling the mall crowds. Maybe you are home decorating for the holidays like me. I’ve got an easy DIY project to share today. I picked up the vintage paper Christmas tree topiary idea from the BHG Special Interest Publication this season so maybe you’ve already tried it? Cut the styrofoam block to size and insert it into your clay pot. You may have to secure the block to the pot with hot glue. Insert the skewer in the center of the block upright. Make sure it is centered and straight with the pointy side of the skewer sticking out. Cover up your mechanics with the reindeer moss. This hides the styrofoam. You may want to glue this as well. Reindeer moss is the most expensive supply used in this project however you could substitute it with a lower cost moss but you may not get the same coverage. Once you’ve got the moss secure, you’ll start building your tree. I chose vintage sheet music cut in squares. You may find other interesting paper ephemera or scrapbook paper works for you. The largest square was 4.5 inches, then 4 inches, 3.5 inches, 3 inches & 2.5 inches. I used about 4 of each size and started by puncturing the largest squares first and sliding them down the skewer to the moss. And in just minutes you’ll have a tree! I topped off the skewer with a fresh cranberry for the star. I ended up not using the raffia on this pair but you can tie it around your pot and make a bow. You could also have kids decorate the pots with paint or glitter. I used this pair to decorate the shop “mantel”. It complements the book page wreath just so. Hope you’ll come visit the shop on Small Business Saturday tomorrow if you are local! You can preview our inventory, special sales & discounts on facebook. 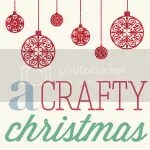 Hey Karah – thanks for stopping by and checking out my Christmas projects! Happy holidays!